Definition: What Are Value-Added Products? At the most basic, a value-added product simply means any product or action that helps you raise the value of your products or business or something you can add to a product that enables you to increase your profit margin. There are all sorts of value-added products and actions, but usually, when it comes to organic farms or organic retail, they're clumped together as "value-added products" or "value-added crops." The term "value-added" in the organic farming industry is synonymous with: niche market crops, specialty crops, value-added crops, value-added agriculture, value-added processing, and adding value. You also may hear the term "value-added opportunities," which relates more to actions you can take, such as making jam from your organic berry harvest, making a unique cheese on your dairy farm, fire roasting your vegetable crops for the Farmers' Market, packaging organic products together in a special way that may increase their value, hosting farm tours or educational workshops. Your value-added opportunities may or may not involve adding value-added products. For example, say you're a farmer who decides to try and increase profits by selling grain-based biomass to his local power plant. The grain-based biomass is a value-added product. Personal fulfillment. Maybe there's a hobby you've always wanted to pursue or a product you've always really wanted to produce. Considering this hobby or this product as something value-added for your business can help you both fulfill that personal dream and make more money. Excitement. Okay, it's not as if making jam is akin to skydiving, but growing the same crops year after year can result in boredom. Anything gets mundane and routine if you do it often enough. Value-added endeavors can add some diversity and excitement to your work routine. Marketing value. Never underestimate how cool niche products can look to consumers. Organic veggies are available everywhere, but if consumers can also pick up organic cut flowers or dried herbs at your farm stand, then you start to stand out. The same goes for organic jam made from your organic berries. Fun and learning. It's fun to try new things, and value-added products can increase your organic knowledge in a new niche area. Eco-friendly aspects. Value-added items and opportunities are very eco-friendly for the most part because they usually utilize the resources you already have, and keep new land use and new raw material use to a minimum, or both. Organic production is not a value-added category in itself, although some people think it is. 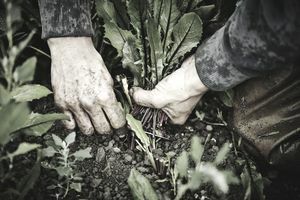 There are plenty of articles and books out there that refer to organic farming as "value-added agriculture," but that's an incorrect use of the term. As Eden Organic smartly points out, value-added organics is: "A misnomer. Organic products have additional value for both farmers and consumers. But those values are not 'added.' They are inherent in organic agriculture's production and management system." Although organic growing and organic production are not value-added, there are plenty of value-added opportunities to be found in the organic industry.